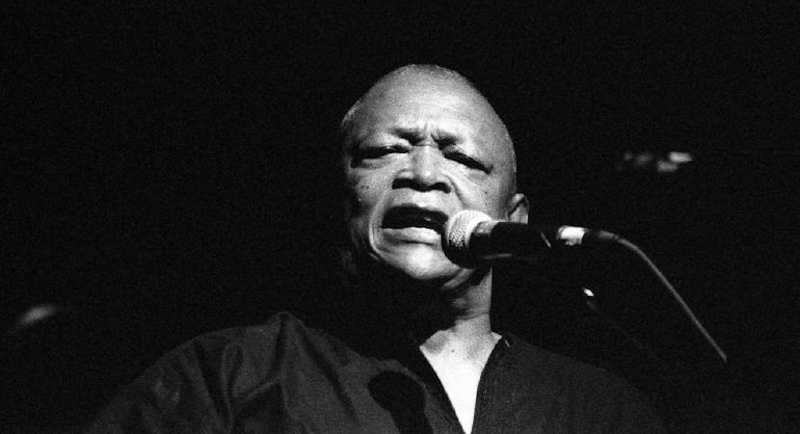 It is with profound sorrow that the family of Ramapolo Hugh Masekela announce his passing. After a protracted and courageous battle with prostate cancer, he passed peacefully in Johannesburg, South Africa, surrounded by his family. A loving father, brother, grandfather and friend, our hearts beat with profound loss. Hugh’s global and activist contribution to and participation in the areas of music, theatre, and the arts in general is contained in the minds and memory of millions across 6 continents and we are blessed and grateful to be part of a life and ever-expanding legacy of love, sharing and vanguard creativity that spans the time and space of 6 decades. Rest in power beloved, you are forever in our hearts. We will, in due course, release details of memorial and burial services. Hugh Masekela was someone who always engaged robustly with the press on musical and social political issues. We laud the press for respecting his privacy through his convalescence, and during this, our time of grief. Our gratitude to all and sundry for your condolences and support. 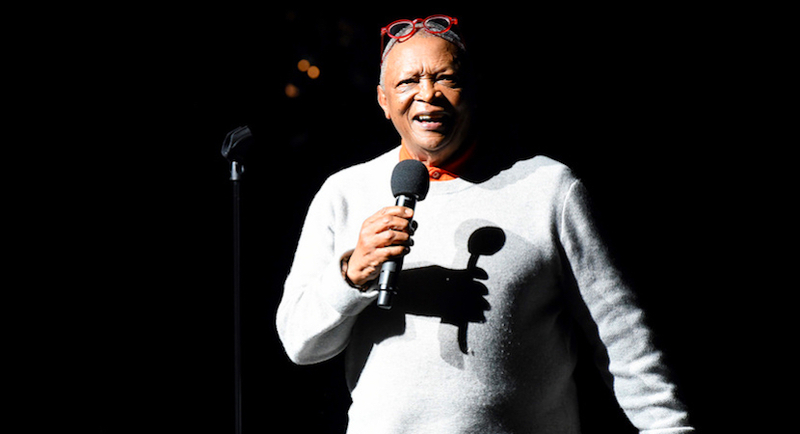 Trumpeter, flugelhorn-player, singer, composer and activist Hugh Ramapolo Masekela has passed away after a long battle with prostate cancer. When he cancelled his appearance last year at the Johannesburg Joy of Jazz Festival, taking time out to deal with his serious health issues, fans were forced to return to his recorded opus for reminders of his unique work. Listening through that half-century of disks, the nature and scope of the trumpeter’s achievement becomes clear. This exposure attracted attention to his talent from potential patrons at home and abroad. 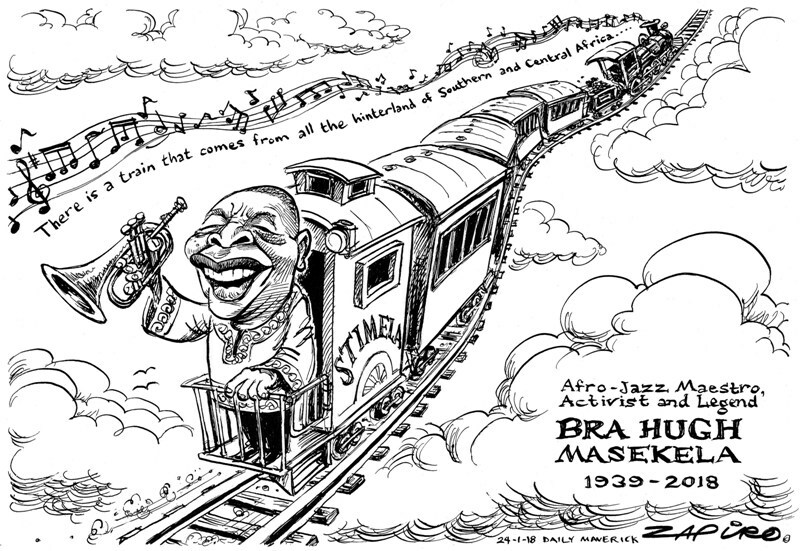 Pushed by the horrors of the Sharpeville massacre when the South African police shot and killed 69 people on 21 March 1960, and pulled by donated air-tickets and scholarships, Masekela left for London, and then New York. 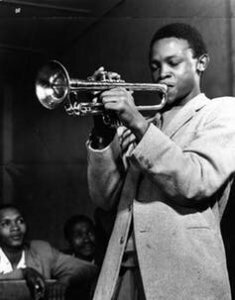 A young Hugh Masekela in the 1950s blowing his horn. To cap the transformation, the individualistic rebel of the 60s and 70s became an elder statesman of social activism. In 2001, he established a foundation to help other musicians escape addiction. Once more he foregrounded the music of continental Africa, to campaign against xenophobia. And the return of his own illness became the cue to exhort other men to get checked for prostate cancer. ‘Blues for Hughie’ from the album, Jazz Epistle Verse One. ‘Unhlanhla (Lucky Boy)’ from The Americanization of Ooga Booga. The major Masekela hit, ‘Grazin in the Grass’. Hugh Masekela with ‘Up Up & Away’. ‘Shebeen’ from The Union of South Africa. ‘The Big Apple’ from Home is Where The Music Is. ‘Stimela’, a South African classic. Hugh Masekela and Larry Willis live. ‘African Sunset’ with Thandiswa Mazwai. Masekela in conversation with the rapper Riky Rick. Gwen Ansell, Associate of the Gordon Institute for Business Science, University of Pretoria. This article was originally published on The Conversation. Read the original article.